Reader. Writer. Geek. An advertising creative by profession, I began my career as a copywriter and eventually found my way to the digital marketing world. Today, I serve as Brand Lead at Google India. Here, I work closely with our agencies to lead our marketing creative work - essentially everything you've seen from Google since 2014. And look after Doodles for India and other special Brand projects. Being married to Saanwari, founder of PoppadumArt, one of India's top indie decor brands, makes me the CxO of her business, where the value of x changes daily. In this role, I sell behind the counter at exhibitions, lug around cartons, and look after all PoppadumArt marketing. In my spare time, you'll find me glued to my Kindle, probably reading sci-fi, fantasy, histories, biographies and business books. I'm a huge fan of Robert Jordan's Wheel Of Time, as also Asimov, Clarke, Superman and Star Wars. My other obsession includes collecting fountain pens to leave behind to any heirs I may have. How I Moved From Creative To Client-Side, With Google...#truestory! Insights on advertising and digital marketing. I was recently invited by DMAi to speak at Global Marketing & Advertising Week (#GMAW15), on creativity in content marketing. Below is an adapted version of that speech. A few years ago, when I was working at one of India’s most well-known content marketing agencies, life was very different. Back then we really struggled to sell the idea of content marketing to clients. The idea of engaging audiences all-year-round with words, pictures and videos, with metrics that were tough to define, was always a struggle to sell. We failed more often than we succeeded. But we succeeded just often enough to help bring content marketing into mainstream conversation. We’ve come a long way since then, I think. We’re all working hard to come up with content to engage audiences in a connected world. To ensure that we look at all our communication through a content lens. To make it part and parcel of our marketing communication DNA. We now have a few years’ experience behind us; we’re learning through trial-and-error and experiments that often fail; we’re learning from markets that are ahead of us; we’re getting better at this game. So what do today and tomorrow hold for us? On my worst days, I’d even write down “run a contest” on that sheet of paper. I could then walk away feeling pretty satisfied, pretty nice about myself. Time for a coffee break. But today, when I’d look at that sheet of ideas the night before a presentation, I’d start sweating. Because all of these have become hygiene. Because having a blog, or creating a hashtag, or running a contest, isn’t a content marketing idea. It’s become a format, another box you just tick. Today, brands like yours are churning out this kind of content day in and day out. The Internet is flooded with it. As are my social media feeds. We’re already churning out content calendars and figuring out how to spark brand conversations during the Cricket World Cup. It’s come to a point where each brand sounds absolutely no different from the next…and I can’t tell which is which just by looking at the content. Which, as you’d all know, is really not a good thing. I’ve always believed that content is the ‘pull’ of marketing communications, rather than the ‘push’. I believe that good content gets people coming back because it entertains, it inspires, it touches an emotional chord, it makes them rant and rage. Or it simply provides a utility or gives them information or education that they weren’t getting before. Good content is also immensely shareable – because of the reasons I mentioned just now. One huge, and often ignored, role of content is to generate positive earned media for the brand. There are huge synergies emerging between content marketing and PR, not just in terms of story dissemination but also in terms of story packaging. I also believe that one can’t restrict content to words, pictures and videos that just wash over people sitting in front of a screen. Interactivity is key. And technology is the answer to immersing audiences deeper into a brand. Apps, games, platforms, devices – they all have a role to play in creating great content. It’s a simple human truth, right? We judge people – our friends, our leaders, our doctors, our wedding photographers – by that yardstick. By what they do, not what they say. It’s the same for brands. In a parity environment, what a brand does matters more than what it claims to do. Advertising is what you say. Content is what you do. Now, what do you mean by ‘do’? I could, as a content marketer, ‘do’ a video. I could ‘do’ a blog post. I could ‘do’ an influencer engagement or ‘do’ a tweetup. But that’s not what I mean. That’s just playing with words, right? To me, ‘doing’ means refocusing on your core brand promise, and then living up to it in front of your audience. In whatever manner works best. It means proving, every day, that you’re true to your words and promise. That you mean what you say. It means focusing less on changing perceptions by making a claim; and more on changing perceptions by fulfilling or exceeding expectations. It means being less of an interruption in people’s lives; it means positively impacting people’s lives through your products, services and brand. One way brands can stand out in a cluttered, parity environment is to create content that proves – honestly, credibly and creatively – what they stand for. And thus start owning that space. Across any screen you can think of. Let me show you a piece of work from one of my favourite content marketing campaigns. Chrome Experiments were begun to push the limits of Web technology, to push the limits of Google’s Chrome Browser. And, to noticeably demonstrate how good the Chrome browser is. The Chrome team didn’t just talk about being faster, or having more features, or being more developer-friendly. They just kept creating pieces of content that proved it. Over and over and over again. And today, many Chrome Experiments are being created every day by developers all over the world, who are not Googlers. Just people pushing the limits of what the technology can do. One of my favourite content marketing brands in the world is Red Bull. Everyone knows that they stand for giving wings to athletes. But they don’t just support these athletes morally, or emotionally or financially. They create platforms for them to shine. They identify athletes, work with them and then co-create content that makes those athletes world-famous. It’s easy for a food industry brand to stick to the conventional food industry metaphors. Blendtec has always been different. They have a core brand promise; they stick to it; and then they deliver on it in the most amazing, culturally-contextual ways possible. India’s favourite beer is known for their baseline – The King of Good Times. Kingfisher have embraced technology to create content and experiences that offer a memorable good time to their fans. It isn’t just B2C marketing that can benefit from this kind of an approach. Every year, around Christmas, the Publicis Groupe create a Christmas card that they put up online. Last year’s card was an interactive experiment designed to entertain – and also to subtly prove Publicis’ strengths in creative digital marketing. I’ll end with a story that’s very close to my heart. Everybody’s talking about the great Indian e-commerce boom. Billion-dollar valuations, transactions-per-day, the payment ecosystem and an ever-increasing user base. Nobody – I repeat, nobody – was talking about the wheels that make this economy turn. Last year, during GOSF, we decided that we should do something special for people nobody cared about. To get them into the conversation and recognise their efforts. Because we believe that the web exists to improve the lives of all people. So, the next time you brief your agency on a content marketing campaign, don’t ask them what you can say. Ask them what you can do. Your biggest asset isn’t your team. Or technology. Or money. So don’t wait for a complete brief from the client to start thinking. Don’t worry if your thinking doesn’t match your client’s. At some point, tracks will converge and a direction will be chosen. Until then, don’t waste a moment. Get to the point fast. The tough part about leading an agency creative team is that you have to set the direction and the vision for the work that you will do. The great part about leading an agency creative team is that you get to set the direction and the vision for the work that you will do. Digital marketing in India has come a long way since I defected from traditional advertising in 2009. Fewer marketers are talking about digital being the future; they’re beginning to see it as a de facto way of life. I, for one, believe we’ve entered a post-digital age, and that all marketing efforts going forward need to accept and leverage that reality. I think we need to go beyond looking at digital as Internet and mobile. I think we have to look at digital marketing as an intersection of three worlds; and that intersection doesn’t always need to reside in the virtual world. 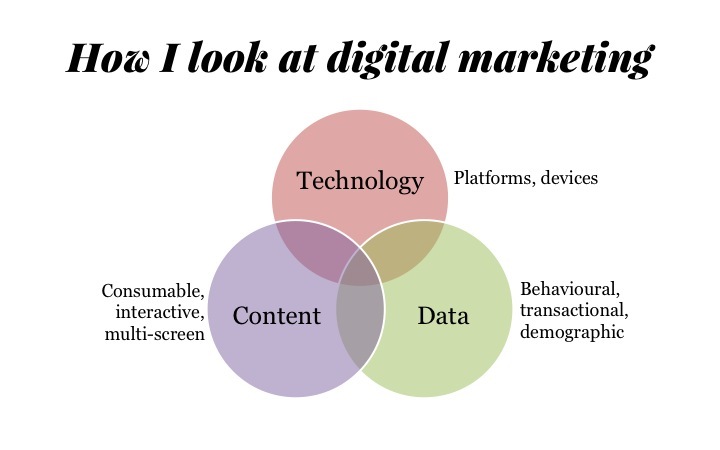 Digital marketing is an intersection of three previously distinct worlds. Forgive me, but I’m going to repeat three buzz-phrases you’ve been hearing for a while. They’re the absolute truth. Content is the new communication. You can’t be a marketer and believe that you’ll achieve brand engagement with a 30-second TVC. Data is the new oil. Because digital allows us to capture what people are actually doing, versus the focus groups that capture what people claim they’re doing. Mobile is the new TV. It’s belittling to call the first screen you look at every morning, the only screen you carry wherever you go, and the last screen you look at every night a “second screen”. The other thing we need to practice is data-driven marketing. If you’ve managed to get past information overload and get someone to actually click through to your content, you aren’t doing yourself justice if you aren’t setting up to reach that person again. Every piece of engagement that you run needs to help you understand something more about your audience. Marketing today isn’t scientific unless it’s driven by data. If one understands these shifts, it’s not difficult to see where digital creativity is going in 2014. Here’s my bucket list for the year to come. We know where you are, what device you’re on, what content you like, your relationship status, your job profile. Which means I can tailor a message to suit you – and just those people similar to you. This year, content marketing will grow up. Brands will need to create content from things they do, rather than just a philosophy they claim to espouse. Hint: Red Bull Stratos. Every year, a commentator like me says that THIS is the year of mobile. But, for the first time in my career, I’m seeing brands invite pitches that specifically have a mobile leg to them. It’s getting serious. Jawbone, Fitbit and Pebble are showing the way. And a new generation of devices, with integrated services, is on the way. How can one ignore a platform that’s touching your consumer’s skin 24×7? Facebook’s organic reach for Pages is on its way to zero. (They said it, not me.) The millions of dollars spent on vanity metric wars seem like they’re going down the drain, no? Brands will – and are- making the move to their own platforms. Where they, not Mark Zuckerberg, will call the shots. Data, beautifully visualised, can tell some fantastic stories. A compelling form of content that more and more brands – and journalists – are experimenting with. Morgan Stanley predicts 75 billion devices will be connected to the Internet by 2020. There’s no better time to build that tweeting urinal, you know. Interrupt at your audience’s point of need. Solve need. Become part of their life. Easier said than done, but software/utility-based marketing is here to stay. It’s only recently that Indian marketers have begun questioning the value of their social media communities. I see an increased focus on quality fans, leading to higher engagement and measurable ROI, especially in the retail industry. And, finally, the elephant in the room. Everybody’s waiting for the public launch. Everybody’s waiting for the open ecosystem. And when it does, we’re going to see a plethora of apps and content developed for and from Google’s futuristic eyepiece. Digital isn’t old enough to have theories. Or gurus. The understanding of the medium, and how to use it to build brands, varies wildly. As a result, the planning and structure of digital campaigns is often a matter of guesswork. The thing is, there is no single method to cracking a digital campaign. You can start with an idea, an objective, technology, data, a platform or the audience. Each method looks at the medium differently. Each method is equally correct. Each truly great digital campaign has, however, some things in common. Let’s break those down into seven steps. The extremely complicated, ever-evolving, one-stop infographic of digital marketing. In a medium that’s targetable, measurable and fast-evolving, writing a good brief needs to go beyond the basics. Step 1: What do we want to say? Nothing different from a traditional advertising brief. Have a single, clear message. If it can be differentiated from competition, excellent. Step 2: Who is our audience and what do we know about them? Digital allows one to segment and target by location, gender, age, browsing behaviour, interests, networks, content preferences, frequency of visits, online shopping habits, search history and much more. Yahoo serves up over 6 billion unique versions of its home page based on this kind of segmentation and targeting. Basically, digital allows you to put aside the bazooka and pick up a flyswatter when you have to kill a fly. Forget the safety of numbers. Go for the effectiveness of tightly-segmented messaging. Step 3: What do we know about their digital media habits that might help us crack this brief? It’s time to drill down and slice-and-dice the data available to you. And it isn’t as difficult as it sounds. Figure out where your audience is spending most of their time online. Which devices they’re using. Which browsers. What they are talking about. When. What time of day. It doesn’t sound like much, but it one well-inferred nugget can lead to a brilliant campaign. Knowing that mums are the biggest online shoppers in India helped us plan an entire campaign for a baby brand. Knowing that most of our aspirational audience surfs the Internet on tablets helped us build a website designed for touch. Knowing the frequency of visits helped us optimise messaging on a website. The more you know about them, the better your solutions. Step 4: What do we want them to say, feel or do as a result of this campaign? Traditional advertising teaches that perception influences behaviour. In digital, behaviour can influence perception. Case in point: Many people I know perceived Twitter as a waste of time. They thought it was confusing, and wouldn’t touch it. But when pushed by friends to use it, they got hooked. They now think Twitter’s the coolest thing since sliced bread. So think smaller. Break down a large objective into more everyday tasks. For example, replace build expertise for our skincare brand with get people to visit our website every time they have a skin-related query. You’ll find a smarter, more effective solution. It isn’t as simple as writing a TVC and crafting the print, poster and outdoor. Our campaigns need to be viral, and that needs a different approach. Digital is a multi-screen platform. Each screen is different in terms of size, content and usage. It isn’t enough anymore to adapt the same message for each screen. Instead, it helps to think of your idea as a story. And use each screen differently, to tell different chapters of it. There are three kinds of media we can use to tell our brand’s story; unabridged, unaltered, under our control. Owned media — the website, the mobile app, any other platforms the brand may have created. Paid media — banner ads, search ads, emailers, SMS. And social media — which is, in my opinion, more leased media than owned. Take the example of a fashion brand. One can use the website to showcase products; the blog to drive imagery; the mobile app to combine a loyalty programme, a virtual dressing room and personalised, location-aware content; targeted, contextual, paid media to tell people what the brand has to offer and drive them back to the website; and social media to help begin conversations around the product range and image. There’s no point in having a great story if nobody’s hearing it. Remember: the average user visits 89 websites a month. And has Liked 80 brand Pages on Facebook. And has 229 other friends filling his or her News Feed. The only way your story will be heard above all this clutter is if you can find enough of the right people to help you broadcast it. Social Influence Marketing refers to leveraging people’s influence on social media to broadcast and amplify your message. However, they’re not going to tweet out your body copy. You have to give them something malleable that they can reshape to create their own unique content, while still staying true to your story. Their mashup of your story then goes out to their own followers, which exponentially increases your reach. Earned media, of course, generally refers to news coverage. While a smart PR agency will naturally tap news media online and offline, there is merit in seeding your story among bloggers and smaller, perhaps category-specific, online channels. It’s a quick way to ensure more and more people know about your story. Make sure your story has something in it that’ll help you get talked about. Then find the people who’ll amplify it for you. People are overloaded with information. It’s easy to miss something. It’s even easier to close a browser tab in irritation or absent-mindedness. So, when someone clicks through to your campaign, be grateful. Very grateful. I always like to give my audience a reward to show how grateful I am. The obvious way is through a contest, or gifts to loyal fans. However, I believe we can do more. People come online to socialise, search for information, find a utility or just for entertainment. Make sure your campaign ticks one or more of those boxes, and you’ll have a reward worth coming back for. The brand must have its reward as well. It could be crowdsourced content, new fans, time spent, leads generated, shares received, hashtags trended, what have you. Identify the rewards the brand will earn. And match them up against your objectives. If they don’t match, maybe you need to rework your campaign. For example, 100,000 new fans may not be a sensible reward if your objective is to get people to spend more with you than they already do, right? 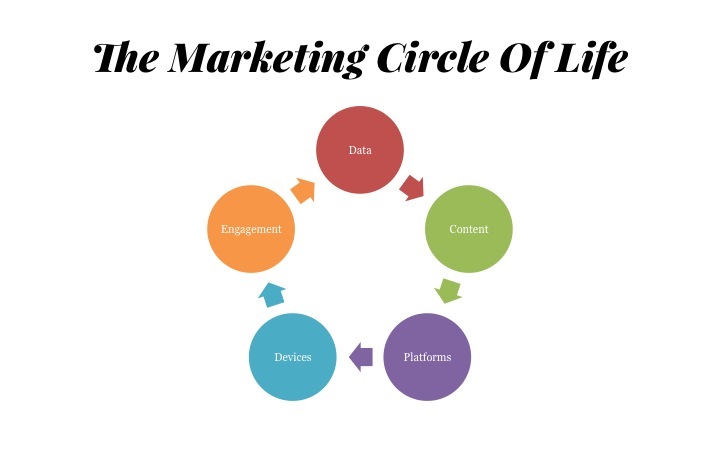 These seven steps aren’t the alpha and omega of digital marketing. But, properly executed, they could help you develop better, brighter campaigns going forward. This post originally appeared on afaqs! Campus.